A basic course for those wanting to learn how to make their own range of cosmetics including SPF Foundation, Blusher, Bronzer, Eyeshadow and Lipstick using the Small Mineral Makeup Intro Kit (Day - Matte) ~ Value $103.50, which you will receive before the class starts. How to discover your skin tone (when you arrive whilst having morning tea). 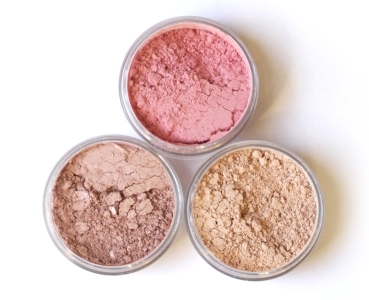 How to create mineral cosmetics from Amor's premade bases using natural cosmetic ingredients. Your investment: $184 (and any extra ingredients you may decide to purchase whilst here). You will need to bring a blender of some form - Magic Bullet, coffee grinder ($16 in KMart), etc. Bring your own lunch - morning and afternoon tea provided, allergies catered for. Location - Mount Manganui, in our Caravan.